From 1919 to 1932 the RAF and the British aircraft industry eked out an existence, tightly budgeted each year under the comfortable assumption that the RAF would not be expected to fight within the next decade. If Government parsimony in the “Ten Year Rule” era slowed innovation, it did so without quite stifling it altogether. The Warren-truss tubular metal construction developed by Fred Sigrist and Sydney Camm at Hawker Aircraft was readily manufactured, robust in service and greatly simplified the rigger’s task compared with the wire-braced spruce and birch structures it replaced. Camm’s 1929 Hawker Hart was the first of that long line of beautiful silver-winged biplanes that equipped the RAF throughout the 1930s. The performance of the in-line engined “all-metal construction” two seat light day bomber was such that this and related Hawker designs were to dominate RAF equipment almost until the declaration of war. The Hart lineage led in turn to other multi-seat variants (the Audax, the Hind, the Demon for example), and to single-seat fighter designs (principally the Fury and the Nimrod). The ultimate descendant of this family of biplane designs was the first RAF monoplane fighter, the Hawker Hurricane (which Camm was mulling over by 1933). Through numerous variants, its strong Warren-truss fuselage contributed to its survival in the front line throughout the war. 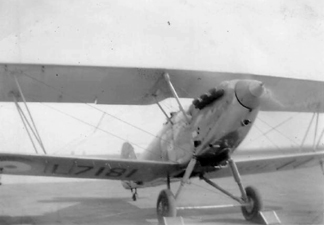 In mid-1931, Hawkers put Hart K1438 forward for evaluation in response to Air Ministry Specification 7/31 requiring an Army co-operation aircraft for duty at home and abroad. The minor modifications included extended exhaust manifolds to obviate flame dazzle for the pilot, and a message hook (“An ‘Art wiv an ‘ook”, they said). An initial order for 40 aircraft was quickly placed. 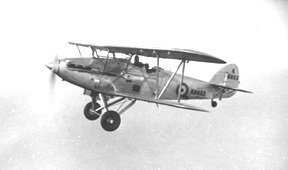 The first Audax, K1995, flew in late December 1931 with aircraft entering RAF service in 1932. Later aircraft received tailwheels in place of a skid. Constructed in quantity by Hawkers (265) and by AV Roe (244), smaller numbers were also produced by a number of the other major manufacturers. Under the press of expansion, production continued until 1937. By the time production ceased, 718 aircraft had been built (including prototypes and foreign orders). The Audax served the RAF well for nearly a decade. Operating mainly in the training role and later as glider tug for the Hotspur at home, in the Middle East the Audax saw service at the sharp end, whether in operational or training units. Audaxes took part in the 1940 East African campaign and in the 1941 defence of Habbaniya in Iraq. 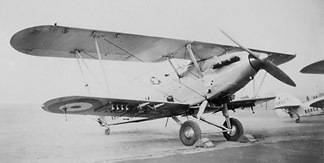 When 211 Squadron re-formed at Mildenhall in June 1937, it was equipped with the Hawker Audax for the initial working-up period from July to October 1937. By August, Hinds were already being taken on charge. The Audaxes were returned to store (4 ASU) in October and November 1937. A unique aerial photo from the collection of Geoff Grierson, thanks to Mike Grierson. 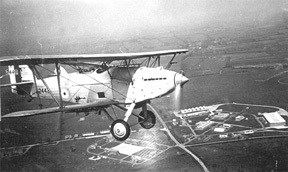 The second aircraft is a Hawker Hind, possibly K6852. Photographed either at Mildenhall or Grantham, no Squadron identification in use. Recent developments have uncovered three other photographs of 211 Squadron Audaxes, all on the ground and not firmly identifiable. The 43 Audax Is built under contract 262679/33 were delivered to the RAF between November 1933 and January 1934. Of this batch, K3689 had seen service with the Royal Aircraft Establishment and with 4 Squadron before being taken on charge by 211 Squadron on 12 September 1937, to remain with them until around November 1937. Geoff Grierson recorded flights in both K3689 and K3708 at Mildenhall. The brackets under the wing tips are the fittings for the Holt flare, a spectacular pyrotechnic then used as a night landing aid. The mounting is in the form of a pendant arm with flare socket at the lower end, thus fixing the magnesium flare a respectable distance below the fabric under-surface of the lower wing. Electrically ignited, the flare provided brilliant illumination, for one to two minutes. The 1935 Gaumont-British film titled RAF includes a short, stunning sequence of a Supermarine Southampton flying boat executing (by the cinematographer’s art) a “night” landing with the under-wing flares lit. Towards the end of the landing run, the still-burning flares drop free into the water. From July 1937: K1998, K2001, K2011, K2013, K2014, K2016, K2018, K2019, K2024, K2029. It is far easier to announce rapid expansion of a branch of the Armed Services than it is to create it. Men cannot fly without training, and cannot train without aircraft. It is perhaps not surprising that the Air Staff turned to the conventional in the first stages of expansion. The period is well described by Terraine and others, and Hawkers’ response to it by Mason. 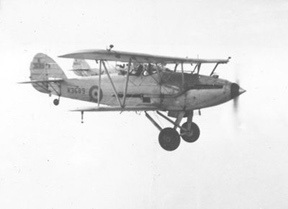 The Hawker Hind thus entered RAF service from late 1935 as an interim day bomber replacement for the Hart, to equip the rapidly expanding bomber force pending development of the Blenheim and Battle. In responding to Air Ministry Specification G.7/34, Hawkers put forward the Hind design. Compared with the Hart, improvements were made for the Observer/Gunner in both the bombing position and in the deep cutaway of the Scarff-ring gun mounting (for slipstream protection and a better field of fire). The Rolls-Royce Kestrel V at 640hp offered more power than the 525hp Kestrel IB of Hart bombers in RAF service. 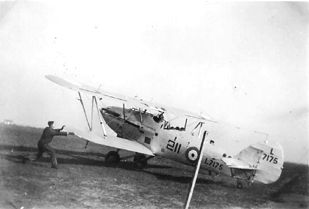 In a concession to modernity, Audax and Hind alike rejoiced in possession of a tail wheel rather than the Hart’s tail skid. A considerable number of Hinds were converted to dual-control trainers. Battles and Blenheims were already entering RAF service in 1937. By April that year, the RAF had 338 Hinds on charge in 20 Squadrons, a further 114 aircraft serving in the Auxiliary Air Force. No Hinds remained in front line service in Home commands when war was declared. Taking its Hinds on charge from August 1937, 211 Squadron initially received K6851-K6855 (from the third production batch of 244 aircraft, contract no 424397/35, delivered between November 1936 and August 1937) and L7174-L7181 (of the fourth batch, of 50 aircraft under contract no 626281/37, delivered between September 1937 and January 1938), and later K6632 and K6633 (again of the third production batch). K6853 in flight, no Squadron number, though other 211 Hinds photographed by Geoff Grierson in the UK wore them. Delivered to 211 Squadron on 19 August 1937, this aircraft went with them to ME. K5389, K5409, K5430, K5456, K5457 (AO-M), K5458, K5477, K5483, K5484, K5520, K5554, K6618, K6675, K6696, K6832, K6833 (211, later AO-N), K6835, K6842, K6851 to K6855, L7174, L7175, L7178, L7180, L7181. *lost in Palestine on air operations at Ain Karim, 3 August 1938, without casualties. See G Grierson and the unknown airman’s Album. The Palestine detachment took ‘A’, ‘B’ and the Squadron HQ Flights to Ramleh, ‘C” Flight remaining at Helwan. The Squadron number on display, somewhere in the UK. About to take off, and possibly photographed from the rear seat of another aircraft. A shot from the unknown airman’s Album, Guy Black’s remarkable find. L7175 was one of the fourth production batch referred to above. Initially allocated to 211 Squadron, the aircraft later saw service with 21 Squadron, 7 Elementary and Reserve Flying Training School, the RAF College, and 1 Flying Training School, ending up as one of the Hinds passed to the SAAF in May 1942. L7180, shown in an embarrassed state on the Squadron markings page and again on the Airman’s Album page, is now held in beautifully restored condition at the Aviation & Space Museum of Canada. L7181, under restoration by Guy Black’s RetroTec in the United Kingdom for his Historic Aircraft Collection. Of these three 211 Squadron Hinds, K5409 and K5430 both went to the Royal Afghan Air Force in July 1939. This photograph probably dates from early to mid 1938, given the use of the Squadron number. From the Hughie Edwards Memorial Photographic Library at the RAAFA Aviation Heritage Museum of Western Australia and shown here with the kind permission of the Museum. No firm date or place, but Egypt. The nearer aircraft, K6855, carries the Squadron number on the rear fuselage, suggesting a date before October 1938. On the apron at what seems to be a permanent RAF station, from the hard-standing and background structures seen faintly in the murk of a very overcast day. The leading aircraft is ready to be armed to the teeth. As a day-bomber, the Hind was able to carry up to 500lbs of bombs, mounted externally. Here, there are not only two Universal Carriers under each wing, but outboard, a single Light Series Carrier as well. The Armament Section loading diagrams for this rarely recorded layout would be interesting to see. Both machines later served with the Royal Afghan Airforce. Contrary to earlier reports, it now seems clear that there were no 211 Squadron aircraft among the considerable number of Hinds sent to the Royal New Zealand Air Force in 1940. Accounts of the RAfAF acquisition of Hawker aircraft differ. While some sources refer to 8 Harts having been acquired in 1937, the generally reliable Jane’s All the World’s Aircraft 1938 records only a consignment of Hinds, acquired in early 1938 and sent, crated, by road! Mason's Hawker Aircraft Since 1920 (another generally reliable source) agrees, noting that eight Hinds were purchased in 1938 by Afghanistan in two batches of four and apparently directly from Hawkers, while recording that 12 Hinds were “turned over” to the RAfAF from the RAF in 1939. “Four a/c were flown from allotment to 102 MU Abu Sueir for Afghanistan”. See also AC1 R Wingrove on this point. 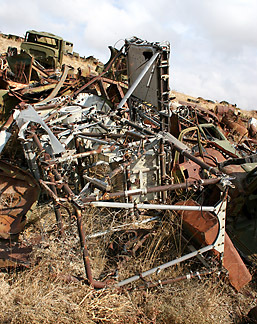 It is now almost a decade since the first reports of a large number wrecked Hinds in a scrapyard at Kabul. They had been languishing there since the 1950s. 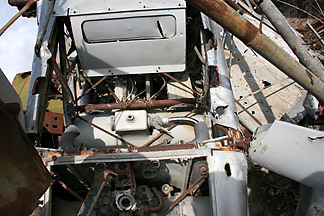 Patrick Chriswick has been working with help from Guy Black and others since 2004 to recover these aircraft. Given the distance and state of affairs in Afghanistan, it has taken much patience, work and time to bring it off. In December 2006, the remains of 12 Hinds arrived safely in the UK. Since the return of the collection to the UK, Pat and Guy have been assessing the remains to sort out which aircraft is which. Six are identifiable airframes: K5409, K5462, K5554, K6618, K6833, (all ex-211 Squadron) and L7191 (ex-21 Squadron). The others are in a poor state but offer a possible source of spares. The recovery was announced at last in articles in Flypast (June 2008) and in Classic Wings Issue 64. K6618 and K6833 had been recorded elsewhere as supplied to India. K6833 was photographed by gunner Geoff Grierson at Daba in October 1938 wearing codes AO-N (the use of that two-letter code by 211 Squadron at the time of Munich had not previously been recorded or shown). K5409 is also shown on this site, from an image held by the RAAF Association (WA).